ALSO DO PIN ON /CLUTCH AND PIN RIBBON BARS ASK FOR DETAILS. SO BEAT THE RUSH. 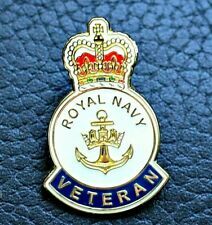 THE ROYAL NAVY ANCHOR RN 26MM LARGE LAPEL PIN BADGE. 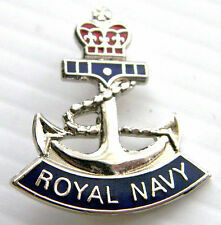 ROYAL NAVY BADGE. ONE BADGE SUPPLIED IN VELVETINE GIFT POUCH. BUTTERFLY CLASP TO REAR WITH. SINGLE PIN FASTENING. GIFT NOVELTY. RN ‘Foulie’ - my personal kit when I left the Navy in 2012. In excellent condition. Size 180/112. No idea if this kit actually was/is goretex but everyone referred to it as such. These trousers are in very good condition - they make ideal work trousers or also good for airsoft, fishing, hunting, shooting, camping and walking etc. They have plenty of pockets. Royal Navy PCS Working Trousers. CL Print Solutions only uses the highest quality material and prints 100% in the United Kingdom. Material: 160gsmPaper. NEW OFFICIAL Submariners Breast Badge / Patch - British Royal Navy. Condition is New. Dispatched with Royal Mail 1st Class Letter. 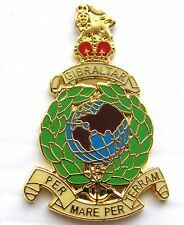 THE ROYAL MARINES BADGE. THE ROYAL MARINES NAVY. LAPEL PIN BADGE. ONE BADGE SUPPLIED IN VELVETINE GIFT POUCH. BUTTERFLY CLASP TO REAR WITH. SINGLE PIN FASTENING. GIFT NOVELTY. CWC G10 QUARTZ MILITARY WATCH BRITISH ROYAL NAVY 0552 ISSUED GULF WAR 1989 FWO!! Type 42 Destroyer Lapel Pin. High military award for Acts of Gallantry during active operations against the enemy. At the centre on the cross is the Royal Cypher. ROYAL NAVY JUMPER COLOR NAVY BLUE SIZE 100cm CHEST. Condition is Used. F S Pratt CREL (A) HMS DOLPHIN. LAPEL PIN BADGE. ONE BADGE SUPPLIED IN VELVETINE GIFT POUCH. BUTTERFLY CLASP TO REAR WITH. SINGLE PIN FASTENING. GIFT NOVELTY. Type 45 Destroyer Lapel Pin. NAVY MILITARY WAISTCOAT GOLD BUTTONS MAN'S DB IN PENSIONERS, RHC SIZE 38"
VTG MILITARY TUNIC IN A GOOD USED CONDITION. I've had too many parcels 'go missing'. Beautifully Detailed Embroidered Patch. made with love by. Rayon - Artificial Silk - Stitching. Royal Naval Officers Gaiters. Liquirish legs. Condition is Used. Dispatched with Royal Mail 1st Class. ROYAL NAVY BLACK WOVEN CAP BANDS FOR OFFICERS CAPS. COMPLETE WITH SECURE PIN BACK FITTING. make Supersized seem small. Get images that. ONE BADGE SUPPLIED IN VELVETINE GIFT POUCH. 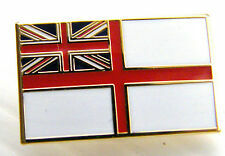 ROYAL NAVY ENSIGN BADGE. BUTTERFLY CLASP TO REAR WITH. SINGLE PIN FASTENING. GIFT NOVELTY. CASD (Continuous at Sea Deterrent). 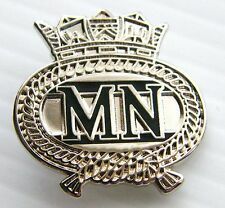 ROYAL NAVY Submariner Trade Badge. Official MoD Issue All Ranks Patrol Badge. 1-19 Patrols. Clutch Fitting Rear. Antique Silver Finish. The image is printed on both sides of the mug. We will always help you to have a 100% positive happy buying experience. British Royal Navy (naval) Chief Petty Officer collar badges and complete button set in issued (pre-owned) condition. Two matching collar trade / qualification badges and larger trade badge. 6 sleeve badges with depressed shanks and 6 tunic / No 1 uniform jacket buttons with raised shanks. Manufactured in the UK, by ourselves, Lancashire Embroidery. WE CAN HANDLE ANY EMBROIDERY REQUEST! Lancashire Embroidery supplies direct to the British Military, aswell as many Allied Countries Military. The strap is passed through a hole in the guard and then wrapped around the guard.